Nippon Biodiesel Fuel Co., Ltd. (NBF) has developed a technology that helps to produce, supply and use renewable energy to replace fossil fuel in remote areas that have little to no energy access. It allows for local consumption and production of energy within rural or remote areas. Providing local residents improved access to affordable energy, this technology also allows them to take part in being producers of energy source. NBF has the know-how to establish a business model of a self-containing cycle of producing and utilizing biodiesel fuel. This is actually a package of technology model that is made up of cultivation of energy crop (Jatropha), fuel production, logistics, utilization of energy and waste utilization. This self-containing cycle helps with the development of an economy which is sustainable and independent. With a process that’s much more affordable than traditional diesel fuel, there is a savings of USD 0.4-0.5/litter when Jatropha fuel is used. In addition, fossil fuel prices typically fluctuate with the market, but Jatropha fuel is more stable. Jatropha is low in financial and labor requirements for cultivation, with a smaller initial investment for business owners compared with plantation models. Providing a low social and environmental impact, this technology does not negatively affect the livelihood or agricultural activities of farmers. That’s because they can cultivate Jatropha as hedgerows and not trees. Also, it does not take long to harvest, allowing farmers to take advantage of this additional stream of income. Participating farmers can enhance their quality of life and explore additional income generation opportunities at the same time. Solar panel or power grid can supply energy in the form of electricity, but liquid fuels are still in demand in rural areas for agricultural machinery such as maize mills, rice mills, and water pumps. Jatropha fuel can be used for these agricultural machinery or for power generation, depending on the demand. Only three to six percent of farmers have access to fertilizers, due to limited access and high import prices. Jatropha fertilizer, on the other hand, can be supplied for one-tenth of the chemical fertilizer’s price tag, saving local households USD 1.44/ kilograms. The addition of usable fertilizer as a by-product makes Jatropha an economical option that reduces waste. The technology to be offered is a package of technologies/know-how to produce, supply and utilise renewable energy to replace fossil fuel in remote areas with low energy access. The uniqueness of our technology is that it enables “local consumption and local production of energy” in rural/remote areas. The model delivers the local residents not only improved access to affordable energy, but also opportunity to participate in the business as producers of energy source. Using NBF-developed high-yielding varieties of Jatropha, offering a small-scale cultivation model of Jatropha, which requires the least cost and with the lowest environmental burden and risk. The Jatropha saplings are distributed to the farmers’ club members and cultivated at their garden and field hedgerows. Fuel production process is comprised of oil pressing, filtering and degumming process. Since it does not involve chemical processing, the environmental pollution or burden will be almost negligible. In addition, it can be done in rural areas as the facility is designed to be simple and minimal. Network for Jatropha seed procurement and fuel sales based on the existing network in the rural areas (i.e. NBF’s farmers’ clubs). Hybrid or dual power generation system. “hybrid system” refers to a combination of solar panel and diesel generator for electricity generation, and “dual system” refers to a combination of power and electricity usage (e.g. maize mill and alternator). For hybrid system, hybrid control system can be installed which can maximize efficient use of Jatropha fuel (i.e. automatic balancing of solar power use and Jatropha fuel use). Waste generated from oil pressing and fuel processing can be utilised for production of fertiliser and animal feed. Advantage 1 – cheaper substitution of fossil diesel: the rural population will save USD 0.4-0.5/litter when Jatropha fuel is used as a replacement of diesel oil (price of Jatropha fuel is about USD 1.3/litter and diesel oil in remote areas is about USD 1.7-1.8/litter). Also, while the price of fossil fuel changes depending on the market situation, Jatropha fuel can be supplied with better stability of price. Advantage 2 – means to produce energy with low investment/cost: since Jatropha requires least financial and labour inputs to cultivation, initial investment is smaller for investors or business owners compared to dedicated plantation models. Advantage 3 – means to produce energy with a minimum social and environmental impact, but deliver additional income: NBF’s model does not disturb livelihood or agricultural activities of participating farmers since Jatropha can be cultivated as the hedgerows of garden or field. It does not affect agricultural activities as farmers does not have to take care of Jatropha trees and harvest can be done in their spare time, but can deliver additional income to farmers. Advantage 4 – multiple usage of fuel: in rural areas, demands for the use of liquid fuel are still high for agricultural machinery such as maize mills, rice mills, water pumps etc. While solar panel or power grid can supply energy only in the form of electricity, Jatropha fuel can be used for power generation as well as agricultural machineries depending on the demand. 27,200 farmer households and 3,600 small and medium enterprises will directly benefit a total of more than $6,000,000 by the year 2018. The business will create more than 1,000 employments in the year 2015 and 2016, and 100 employments from the year 2016 onwards. The affordable energy will enable rural residents to receive better social services (i.e. for vaccination storage with refrigerator and safer childbirth in the health centers). Advantage 6 – Affordable and locally-available fertiliser: national average of farmer’s access to fertilizers is about 3 to 6%, because of the limited access to fertiliser itself, and the high price due to import and transportation costs. Jatropha fertiliser can be supplied for one tenth of chemical fertiliser’s price. The local households could save USD 1.44/ kilogram by purchasing Jatropha fertilizer. Production network: 6,000 contract farmers/60 farmers’ clubs have been established. It is comprised of oil pressing, filtering and degumming process. It is feasible and affordable because the process is simple and low technology, and does not require special chemicals. The produced fuel is proved to be usable as substitute of fossil diesel, such as for diesel generators and maize mills. Already established a producer’s network of 6,000 farmers/100 farmers’ clubs in Cabo Delgado Province of Mozambique. Network with maize mill owners is established. Proved to be usable as substitution fossil diesel. Used for 20 maize mills for more than 3 months. Used for 2 diesel generators for more than 3 months. Hybrid system of PV panels and diesel generator by the cooperation company (Okinawa Enertech). According to the research by Kasetsart University, agricultural productivity, especially for tomato and sweet potato increases more than 1.5 times when biofertilizer is applied to 10 tons/ha for tomato and 2.5 tons/ha for sweet potato. So far NBF has leased 100 phylesis saplings and sold 10 phylesis of seed (100 seeds). The existing customers include JICA, a Japanese major petroleum company, a major agricultural machine manufacture, and a biofuel company. Throughout these sales, NBF has made a total sales of approximately 80 million yen (USD 0.8 million). We supplied Jatropha fuel for diesel generators for 3 months as a part of NEDO’s Feasibility Study in 2012. We have been supplying fuel for 2 diesel generators in NBF’s local shops in rural villages for running refrigerators and charging of portable lights. We have been supplying fuel for 20 maize mills. We have been supplying fuel for Movitel (a Mozambican mobile phone network operator) to conduct engine combustion tests. Visible result has been obtained in an experiment to apply fertiliser to vegetables and Jatropha in NBF-owned fields. We are currently conducting experiments in corporation with several farming companies in Nampla and Cabo Delgado provinces. Positive commitment of farmers for cultivation activity is essential for the success of this business model. 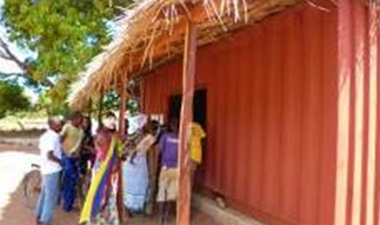 NBF is strategically establishing the network with approximately 6,000 farmers in Cabo Delgado. To strengthen the tie with the farmers, NBF keeps constant communication with the farmers’ clubs through regular visits, and also purchasing their agricultural products (i.e. rice), and even selling daily consumables to farmers in some areas. By becoming essential part of farmers’ life by bringing various benefits to them, farmers will continue to sell the seeds to NBF and are unlikely to be disturbed by other buyers who come into the area afterwards. Risk regarding losing competitiveness due to the price drop of liquid fossil fuels and access increase to the grid electricity. According to the world trend of fossil fuel market, the fossil fuel price is unlikely to drop in the long run unless there will be a dramatic market change or infrastructure development in the area, which is unlikely to happen given the situation. There are possibilities of competition with other agricultural crops over the use of land and water resources. In the NBF’s model, Jatrpha will be planted along the border of farm land as live fences and not be planted inside the farmland, which indicates, unlike centralised plantation cultivation model, that the land pressure will not affect the cultivation of Jatropha. Moreover, Jatropha does not need a large quantity of water to grow and it survives in semi-arid areas. Thus, there are very little possibility of conflicts over water use as compared to other cash crops. Basically Jatrropha is a drought resistant plant. However, when the extreme whether such as severe dought or flooding the harvest of Jatropha could drop for a certain amount. Unlike other agricultural crops, Jatropha can be stablely stored in seeds or in oil, therefore, some drop of harvest can be covered with stock. Also in preparation for such event, by modifying blending ratio of Jatropha oil and other additives, production amount of end product (JAT-DIESEL) can be controlled. In terms of Mozambique, NBF intend to make a direct investment on establishment of value chain of a biofuel (cultivation, transportation, fuel production facility). Direct investment has been done since the 2013 in Mozambique. In expanding business in Sub-Saharan countries other than Mozambique (namely Tanzania and Kenya), NBF will partner-up for joint venture arrangement with local companies.